To be able to either travel in your own caravan or use one as a base is an enjoyable holiday for the family who are planning to take their pets with them. 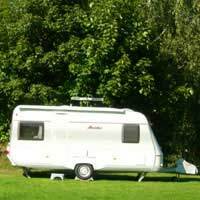 If you are contemplating purchasing a caravan it may be worth hiring either a static van or a mobile one to see if you, the family and your pets are suited to this form of travel and holiday. If you are new to this form of holiday ask around before booking your first pitch. Speak to family, friends and colleagues any one of which may have stayed in this popular form of holiday destination. There are also publications aimed at the caravan user, websites and forums are plentiful for research. Check with the local tourist board for the area and tell them you are new to caravanning and want to take your pets with you, they are sure to be able to advise you. Also remember to give your own feedback for future holidaymaker's once you have returned from your own holiday. Make sure that when you book your pitch or holiday that the manager is aware you will have family pets with you. It would be very disappointing, and expensive to arrive and find that the site rules had been changes. Ask about the walking pets in the area of the caravan site. Are there woodland walks? Can the pet go on the beach? Is the site pet friendly? You do have to find out before you book whether the site you intend to stay on is pet friendly. It is fine to see that it is listed as such in the advertising literature but you need to know that this does not just mean that you are charged a few pounds extra each day for the privilege of him being allowed on the holiday. The motor home is another popular vehicle for those who like to tour to different holiday destinations. The only problem for pets is that you will not have a separate car and they will have to travel in the body of the vehicle. Cages and suitable crates will be needed for the pets during travelling times. Where will the pets sleep while you are tucked up in your cosy berths? It may not be a good idea to let them wander freely as they may have done at home. There is the chance that they may escape if the door is opened or they may chew, soil or damage the furnishings as the environment is strange to them. A cage is the perfect solution and can also be put into the car whilst on the move. Never leave a pet alone in a caravan while it is being towed. Most caravans and camper vans have the added benefits that can be fitted to the vehicles once they are in situ. This is the ideal place for the pets to sleep at night as long as they are secure in their cages and crates. Even on cooler nights a heater can be used to make the room as comfortable as home. For added safety ensure that the awning is zipped shut and perhaps have one member of family also sleep with the pets. For those that travel to dog and cat shows and want to make more of their journeys caravans are an ideal proposition. Within the dog show fraternity there are exhibitors who regularly meet up at the larger summer championship shows. There is a whole community of caravan users and campers who stay for the three or four days of each show, holding barbecues and social events before moving onto the next show on the agenda. When leaving a pet outside the caravan ensure they are attached to a stake. Do not have them tethered to too long a lead or they may be encroaching on the next caravan’s pitch. One bonus of staying in a caravan is that you can prepare your own pet’s food with ease and feed him at a time that keeps to the family routine.